Last week we looked at the Dorian Mode. In addition to proposing some exercises to help you practice it, I mentioned how we each have a preferred sensory method for learning, either visual (seeing), auditory (hearing), or kinetic (touching). As musicians, there would seem to be a bias towards learning through listening, however I know I am a strong visual learner: if I try to play a piece I know from a different edition of the score, it feels like I’m learning it all over again! I’ve always known that one of the greatest hurdles to improvising is the the fear of not having a score on the music stand, but perhaps that’s related to a person’s learning mode more than not knowing what to play? Which mode do you favor when learning music? Is it different from how you might learn other subjects? Are you a big picture person? How closely do you pay attention to details? If you are giving directions on how to get somewhere for someone, how much detail do you provide: general guidance (left at the end of the street, then left at the third light) or turn by turn instructions with descriptive landmarks (left when the road ends at the airport, through three lights, crossing route 50, turning left on Maguire after passing the mall before entering the next subdivision)? I recognize that my first approach to an area is from the big picture perspective. You can call this “Ready, Fire, Aim.” (There’s even a book by this title: Ready, Fire, Aim: Zero to $100 Million in No Time Flat about building a business this way!) Want to learn to improvise? Start by sitting down at the bench and playing. Next step, refine what you played into something better. This is how to get over that first hurdle of playing without a score in front of you. The big picture viewpoint to to simply start playing something. Afterwards, we aim for improvement and choose a direction to focus our attention. Play a quarter note ostinato pattern with the left hand on soft 8′ foundations – perfect fourths with the top note melody being E-F-G-F. Finally add a melody on a solo stop played by the right hand. Begin the melody on something other than tonic. Create a four measure phrase before arriving at tonic. Create a second four measure phrase that contrasts with the first phrase. Conclude by repeating the first phrase. In some ways, the detailed approach can provide more success, but it also leaves less room for creativity. What happens when we play a note outside the mode with our right hand? Do we stop? Is that instantly a bad improvisation? Do we brand ourselves a failure and never improvise again? Of course not! Sometimes a little slip can focus our attention and help us move into flow making an even better overall performance! The best teachers are able to meet the student where he or she is and open doorways to new areas of learning, providing the right amount of detail to enable the student to step through those doorways. In the end though, it is up to the student to step through the doorway. Are you practicing your improvisation skills? Are the instructions I am providing detailed enough for you or are they too general? 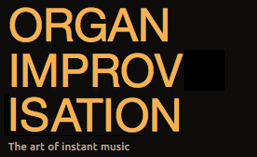 What else can I do to help you become a better improviser? If these posts are helpful, please sign-up for the newsletter or take a moment to let me know more about you and your interests in improvisation by leaving a comment below. The more I know about you, the more useful this newsletter and website will become. Posted in Lesson, Newsletter. Tagged Learning, Newsletter. Some people learn best by watching someone else do the task first. Others need to hear someone give an example. This is one of the reasons why I include YouTube videos at organimprovisation.com. While all of the videos provide auditory examples, when I am searching for videos to include, I will give a preference for those where you can see the player’s hands at the keyboard as well. I know from my own personal experience that it has been very helpful in my learning process to be able to see exactly how someone is creating the sounds that I am hearing. The organ offers so many different sound combinations and such complex sounds (through the use of mixtures and other upper work), that a quick glance to see where the hands are at the keyboard can settle many questions that the ear might have posed. I remember even my teacher peering around the corner once after I had been asked to improvise with my left hand and feet alone. I’m sure he was checking to make sure I didn’t slip my right hand into the texture! Some people also learn best by touch. You can explain to them and show them, but until they can use their hands and do it for themselves, their learning will be incomplete. For me, this is where scales, arpeggios, cadences and other progression exercises help train us as improvisers. Any one who has ever memorized a piece of music is familiar with the idea of muscle memory. We need to find ways to train and take advantage of this muscle memory when we improvise as well. Knowing our muscles know where to go next frees up brain power for us to focus on form or any of the other elements we need to consider as improvisers. As a young piano student, I learned to play all the major and minor scales, along with arpeggios, chords and cadences. These drills helped build technique and were my introduction to harmonic theory. If you have not learned to play scales, arpeggios, chords and cadences (I-IV-I-V-I) in all the keys, I strongly urge you to do so. While I have most often done these at the piano, we shouldn’t forget to practice them with our feet as well. Go as slowly as you need to in order to play accurately, then you can work for speed. While the major and minor scales are part of most every musician’s formation, other modes are frequently omitted or only touched briefly. As an improviser, I believe the more tools we have in our toolbox, the better we will be prepared to improvise on any given theme. For this reason, I’d like to recommend spending some time getting to know other modes as well as we know the major and minor modes. As mode number one in the codification of the church modes used for Gregorian chant, I’d like to start with the Dorian Mode. It differs from the natural minor scale by having a raised sixth degree. Rather than playing minor scales this week when you practice, how about playing the Dorian mode? Be sure you can play the mode starting from each of the different pitches. If you need to verify or want to have a reminder in front of you, I prepared a pdf that you can download here. Play the same arpeggios, chords and cadences that you would play when practicing a major or minor scale. Practice any other technical exercises that you might normally do (Czerny or Hanon for example) in the Dorian mode. Change the key signature for a hymn to the equivalent Dorian mode signature. This will be easiest with hymns that have no accidentals, but you could also try with more complicated hymns. Create melodies in the Dorian mode. Be sure to include the scale degrees that make it different from the natural minor so that you can learn to hear the difference. Practice the Dorian mode in different keys by playing a pedal point on the tonic and chords or melodies with the hands. After 1-2 minutes, change the pedal point and tonic to a new key. What else can we do to get the Dorian mode into our ears and fingers? In the coming weeks, I plan to include posts about other modes on the website, explaining how they are constructed and identifying themes that are in the mode. All of the suggestions for the Dorian mode today can be (and should be) applied for each of the other modes that will be presented in the weeks to come. Part of creating colorful improvisations is the ability to use different modes. Regardless of how you might choose to go about learning the modes, be sure to find a way to include them in your improviser’s toolbox. Posted in Lesson, Mode, Newsletter. Tagged dorian, Learning, Lesson, Mode, Newsletter, Nike, Pablo Picasso.